When the poet looks up the sky he sees the rainbow and feels very happy. 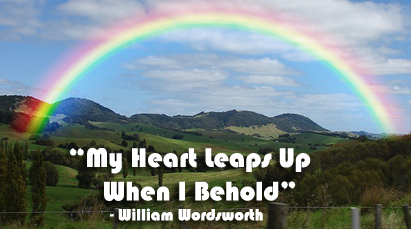 The poet says he was born with rainbow because when he was born it was there an it still remains there. He believes that it will remain in the sky throughout his life. Again he says if the rainbow goes away, he cannot live without it. The poet wants to be a child again because he says he has a deep love to rainbow and he expresses that child is the father of man. The poet has a great belief in nature and he says nature provides life and life is related to nature. There is inseparable relationship between life and nature. The poet respects the nature all the time. अथवा मलाई मर्न देऊ ! Answer: The poem talks about relation between nature and the human life. Answer: The statement is a paradox because we think that man is the father of the child and the child can not give birth to a man. But a child of today becomes a man of tomorrow and yesterday's child is a man today. So the role changes. Time makes the child a man. So time is changeable and then child changes with time. Answer: The poem deals with time and the comparison between nature and life. Present is guided by the past and certainly future will be the result of present. Our life cannot go away from the natural rules. Life is related with nature. The rules of nature and the rules of life are similar. We cannot live without the help of nature. Nature is everything and we have great interest in nature. Rainbow is a part of nature and life is a part of time. Life has various stages of time and rainbow always appears in the sky. Answer: The poet used to see the rainbow in the sky when he was child. Now also he sees the same rainbow in the sky. So it reminds him of the past. He recollects those emotions, strong feelings and writes this poem. Line 7: the theme: the present is the outcome of the past, so naturally the future will be the outcome of the present. Answer: In line 1 and 2, the poet shows the effect of seeing rainbow which makes the poet's heart leap up and feel happy. In the line 3 and 4, the poet says that the rainbow was in the past when he was a child and it is still in the sky now. In line 5, he thinks the rainbow will remain till his old age or till the nature exists. Similarly in line 6, the poet wants to die if the rainbow from the sky vanishes. He wants a regular relation with nature. In line 7, the poet represents the theme of the poem. He says child is the father of the man, yesterday's child is a man of today and today's child be the man of tomorrow. The past guides the present and the present determines the future. In lines 8 and 9, the poet wishes his days to be filled with natural piety forever and feels happy to keep relation with the nature. Life goes with nature. Answer: The poet uses the past and says there was a rainbow in the sky when he was a child. The rainbow is in the sky now in his present and he hopes that it will be in the sky throughout his life in the future. Life is related to nature and nature runs with time. So, the poet uses all the tenses. Answer: The poet means that nature is the creator or god. He says that nature and god are one. So, he wants to respect the nature from the depth of heart. Summary Of "My Heart Leaps Up When I Behold"
Class 11 Course "My Heart Leaps Up When I Behold"
Translation In Nepali Of "My Heart Leaps Up When I Behold"
Word Meanings In Nepali Language Of "My Heart Leaps Up When I Behold"
Question Answers Of "My Heart Leaps Up When I Behold"
0 Response to "My Heart Leaps Up When I Behold | Summary | Translation In Nepali | Wordmeanings | Question-Answers"